Welcome to Discover, a new quarterly publication for you, our dedicated donors and partners. For over a century, the Girl Scout Movement has been dedicated to building girls of courage, confidence, and character who make the world a better place. At Girl Scouts of Utah, we work with thousands of girls who discover, connect, and take action in their own communities. All this is made possible for local girls in Utah, regardless of their family’s socioeconomic status, thanks to your support. We hope you enjoy these stories of incredible adventures, opportunities, and successes happening right here in Utah. The North Face Adventure Pilot Girl Scouts of Utah chosen to test new high adventure badges from GSUSA Earlier this year, The North Face and Girl Scouts of the USA announced an exciting program collaboration “to enable the next generation of women to push boundaries and move mountains.” Girl Scouts of Utah was honored to be one of the two councils in the nation chosen to help pilot the brand new badges and programming from The North Face and GSUSA. The North Face and GSUSA’s outdoor high adventure initiative was created to introduce girls of all ages to new outdoor experiences. The collaboration includes 12 new Outdoor Adventure badges and programming ranging from mountaineering and climbing, to backpacking, hiking, and trail running. These new high adventure badges are offered at all age levels and include skill progression allowing girls to push their limits and reach new heights. 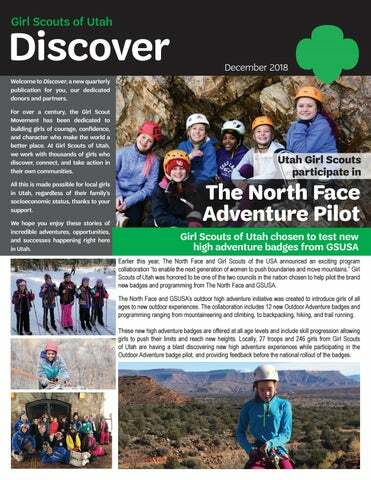 Locally, 27 troops and 246 girls from Girl Scouts of Utah are having a blast discovering new high adventure experiences while participating in the Outdoor Adventure badge pilot, and providing feedback before the national rollout of the badges. Inaugural Utah Day of the Girl Honors University Presidents, Highlights Impact of Girl Scouts On October 12, 2018 the Salt Lake City Marriott Downtown at City Creek was buzzing with excitement as 57 high-school-aged Girl Scouts and young alums joined 430 business and community leaders for Girl Scouts of Utah’s inaugural Utah Day of the Girl signature event. This celebration of the power of girls in Utah was held to coincide with the International Day of the Girl and highlighted the positive impact that women and girls have on their communities. The celebratory event, presented by Dominion Energy, provided an opportunity to recognize Utah’s five women university presidents as our 2018 “Girl Champions.” We also welcomed edcUtah President and CEO Theresa Foxley who discussed the importance of investing in girls to build the pipeline for Utah’s economic health and stability in her keynote speech. Utah Day of the Girl was as much about recognizing current girl successes as it was providing an unparalleled mentorship opportunity for Girl Scouts. Throughout the course of the event, girls learned about potential career paths from local business leaders and women in higher education who lead the way in academic achievements. Every girl who attended the event had the opportunity to sit and network with a table of women and men from various industries. Utah Day of the Girl provided an inspirational and powerful message about Girl Scouts and our impact on young women in our community and throughout the world, and we look forward to the 2019 Utah Day of the Girl! Morgan Barron, one of 57 girl attendees who received at-table mentoring, meets with University of Utah President Ruth V. Watkins. Caitlin Burchill, KSL TV reporter and event emcee, shows off her sashes. Theresa Foxley, President and CEO of the Economic Development Corporation of Utah, delivered the keynote presentation. Celebrating Success: GSU Honors 16 Gold Award Girl Scouts This November, Girl Scouts of Utah celebrated 16 girls who earned their Girl Scout Gold Awards, the highest award a Girl Scout Senior or Ambassador can earn. Gold Award Girl Scouts spend a year or more completing a Gold Award project that resonates with them individually. Each girl creates her own personalized leadership journey through self-improvement, skill development, career exploration, and community service. They identify the root cause of an issue they want to address, ensure sustainability after their involvement, and put their plan into action. This award is a culmination of all that a girl has learned in Girl Scouts, and shows communities, leaders, employers, and colleges that girls are changing the world. Our 16 Gold Award Girl Scouts combined their love and knowledge of subjects like STEM, the arts, history, and music to give back to their communities. Their Gold Award projects included bringing STEM education to a school in Ghana by distributing 18 computers and providing technology training to teachers; creating new resources for teachers that focus on overlooked but important women in history; increasing local STEM participation by creating and running robotics workshops; and initiating an annual food and clothing drive. 2018 Gold Award Girl Scouts at our annual Recognition of Excellence, held on November 3 at the Utah Valley Convention Center in Provo. Our Gold, Silver, and Bronze Award Girl Scouts were all honored on November 3, 2018 at our annual Recognition of Excellence event. In addition to our 16 Gold Award Girl Scouts, we also celebrated 78 Silver Award Girl Scouts and 240 Bronze Award Girl Scouts. Every one of these Girl Scouts helped make her community a better place, and we are excited to see what they will do next. Science, Technology, Engineering, Math, and Girl Scouts The future of our economy will be driven by STEM (Science, Technology, Engineering, and Math). STEM jobs are projected to be some of the fastest-growing opportunities in the next decade, but only 25% of the STEM workforce is made up of women. Girl Scouts of Utah is changing that number. With the recent release of 23 new STEM badges, as well as additional STEM Journeys, Girl Scouts of Utah is introducing more girls to STEM, boosting their confidence, and helping them find how STEM fits into their lives. Through Girl Scout STEM programs, girls are able to lead their own exploration of STEM, engage in cooperative learning and teamwork, solve problems, and take on leadership roles. STEM activities are integrated throughout Girl Scouts of Utah’s programs to provide hands-on learning opportunities in engineering, programming, astronomy, robotics, and more. Girl Scout STEM programs allow girls to work in a progression as they continue learning and developing their STEM skills as they advance. One of the ways Girl Scouts of Utah engages girls in programs with progression is through offering FIRST robotics teams which help our girls get involved in a long-term STEM activity. Girl Scouts of Utah girls are already becoming STEM champions! GSU’s FIRST Tech Challenge Robotics team the CookieNauts recently competed in a robotics competition where they finished seventh in the robot game and qualified for the state championships in February. The CookieNauts are paving the way for girls in STEM in their community and are already serving as role models for Girl Scouts who are just getting started on their own STEM Journeys. 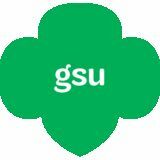 Leave a Lasting Legacy Invest in girls today, tomorrow, and for the future by joining the Juliette Gordon Low Society and including GSU in your estate plans. The Juliette Gordon Low Society of planned giving celebrates the girls of the future and ensures their opportunity to be Girl Scouts. Together, we will empower girls to reach their fullest potential and build a better world. These thoughtful and generous financial gifts will help support and sustain Girl Scouting and will extend your involvement in the Movement beyond your lifetime. Contact us today to share your plans or to discuss the best gift option for you. The impact of your gift will shine through the smiles, the laughter, and the achievement of millions of Girl Scouts for years to come. We would like to extend a warm welcome to GSU’s Interim CEO, Mary Charles, who joined the council on November 26. Mary is an accomplished Girl Scout professional who has been recommended to us by GSUSA through their national Interim CEO program. This program connects councils with an interim who has exceptional experience as we evaluate where the council is and what kind of leader is needed. Mary has served as a CEO for four Girl Scout Councils and as an Interim CEO since 2010. Girl Scouts of Utah is her seventh interim assignment. The staff at GSU is looking forward to learning as much as they can from her during her time in Utah. ǓǓ Please invoice me ǓǓ Company Match, Employer Name: In compliance with PCI regulations, this section will be removed and destroyed.